The spokesman continued by reiterating the importance of the international community putting pressure on Israel to maintain the historical and legal status of Al-Aqsa Mosque. He blamed the Israeli occupation for anything which undermines the safety of the mosque and its worshippers, as well as calling for Israel to end all such measures immediately. Jordan also called on Israel to hand over the brick which fell from the Al-Buraq on 23 July to Jerusalem’s Awqaf Department. 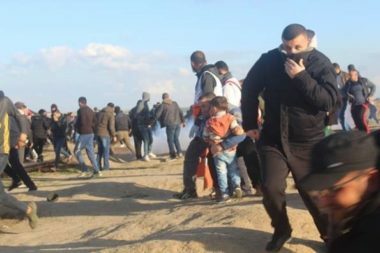 QALQILYA, PALESTINOW.COM — The Israeli occupation forces (IOF) on Friday afternoon arrested a Palestinian and assaulted others during clashes in Kafr Qaddum town in Qalqilya. 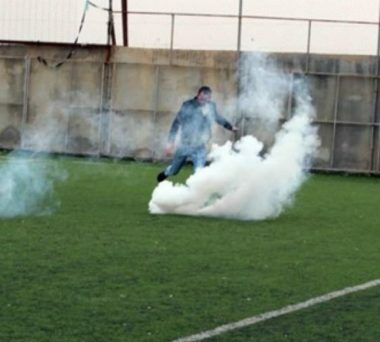 Local sources told the Palestinian reporter that the IOF arrested a Palestinian child identified as Tareq Hekmat during the confrontations and heavily fired teargas bombs at Palestinian protesters. 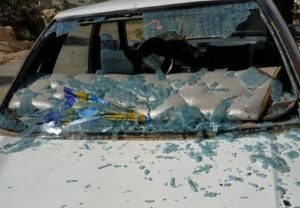 They said that the IOF further assaulted a number of journalists who were covering the weekly protests in Kafr Qaddum and prevented Palestinian citizens from entering or leaving the town. When I met Ghassan Najjar, in the WestBank village of Burin, I gained the impression of speaking with a young man considerably older than the 26-year-old before me. As he pointed out during our conversation, under Israeli occupation children have to grow upfast. 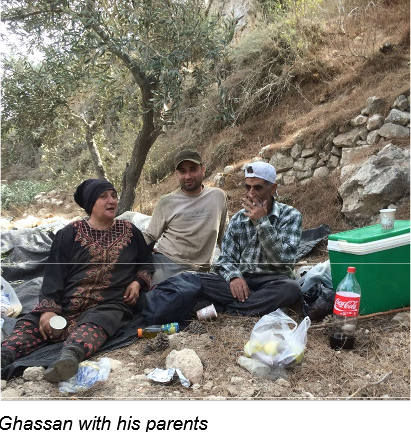 It was in 2000 when Ghassan, aged 10, first came into contact with the Israelioccupiers. He was helping his father, Zidan, and other members of his family in their apple orchard on a ridge overlooking the village when they were attacked by a group of armed men from the nearby Brakha settlement who wanted the land for themselves. They shot Ghassan’s cousin in the leg while Israeli soldiers looked on. 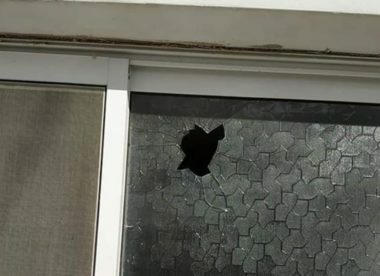 Following a number of similar settler attacks the army prohibited Zidan from accessing his orchard, so he obtained a court ruling that confirmed his right to work on his land. However, the army promptly invalidated the ruling by declaring the land to be a closed military zone, after which the 1,500 apple trees and a well were destroyed. Zidan and hisfamily were barred from entry permanently. 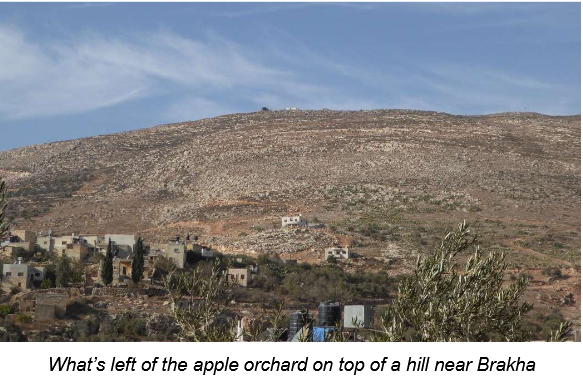 It was during that time that the army also seized 65 dunams (16 acres) of land What’s left of the apple orchard on top of a hill near Brakha belonging to Ghassan’s mother. It was unsurprising, then, that by the age of 15, Ghassan and other local boys would throw stones at the sight of soldiers for which he was arrested and charged. Ghassan was sentenced to six months in the juvenile section of HaSharon Prison in northern Israel [contravening the Third Geneva Convention, Article 4, which states: “protected persons accused of offences shall be detained in the occupied country, and if convicted they shall serve their sentences therein]. Four years later, Ghassan was charged again, this time accused of subversive activities against the Israeli state. 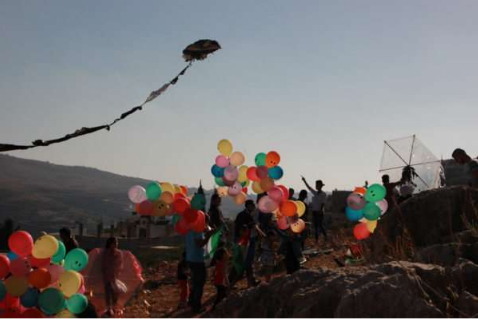 For organising community events, such as flying kites decorated with Palestinian flags, and taking part in demonstrations to support local farmers experiencing settler attacks and land seizures, Ghassan was sentenced to one year and eight months in Megiddo Prison, again in northern Israel. The wheels were thus set in motion for Ghassan’s third prison sentence. That night, soldiers visited the homes of his brother, Abdullah, and his cousin, Zaid, who were not accused of any offence. Both young men were badly beaten and brought to Ghassan at his home where he lived with his parents. There they were ordered never to see Ghassan again. The interrogations started. Ghassan told me the officials wanted to know names of friends and associates. He described how he was seated in a chair with his hands tied behind his back for one to two days, allowed to visit the bathroom for five minutes every 6 hours. On other occasions he was laid handcuffed to a bed with his arms and legs outstretched. Despite the stifling heat, he was often refused permission to shower. 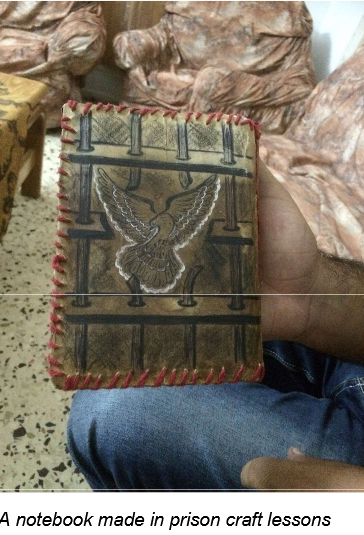 Still in custody, Ghassan spent the next 14 months in Megiddo Prison. Here, the prisoners were divided into blocks of 120 prisoners according to their political affiliation. Ghassan’s block was for members of the Peoples’ Front for the Liberation of Palestine. Every block contained cells, each holding ten prisoners and equipped with electric rings for cooking. “The daily routine at Megiddo was crushing,” said Ghassan. “Prisoners remained in their cells during the day except for two hours in the morning and evening when they walked up and down corridors. Ten prisoners a day from each block were allowed to play sport for an hour, which they took turns in doing.” Prisoners received 400 shekels (£86) a month from the Palestinian Authority for food either from the canteen, run at a profit by the Israeli company Dadash(2), or from a shop for prisoners to prepare themselves. The canteen was expensive and the food inadequate and of poor quality: “For breakfast we would be given a single egg and a packet of crisps which cost ten shekels (£2.17).” So prisoners prepared their own meals. 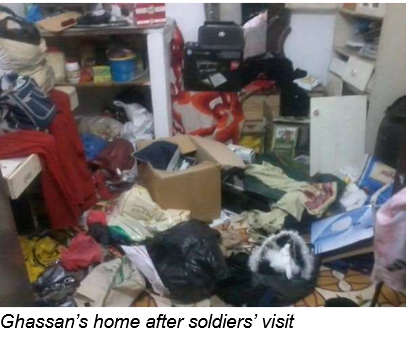 About a month into his detention at Megiddo, Ghassan first met his lawyer. Six months later, his mother received permission to visit her son, assisted by the Red Cross. From then on she could visit him quite regularly, although his father, aged over 70, who had also been imprisoned by the Israelis on a number of occasions, had to wait longer and subsequently was only permitted visits every 6-7 months. After Megiddo, Ghassan was transferred to a punishment prison, Hadarim, also in northern Israel where he spent two weeks in isolation. Ghassan believes it was because he threatened to go on hunger strike that he was moved quickly to Gilbo’a Prison (again in northern Israel) where he stayed for a year until his release. It was while he was at Gilbo’a, 18 months after his arrest, that Ghassan’s trial finally took place at Salem Military Court. “I was accused of attacking the soldier at the boys’ school and of subversive activity,” he explained. 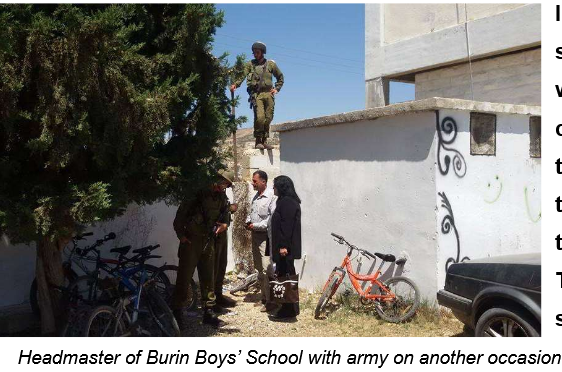 The District Army Commander gave evidence as well as the ‘ravshatz’ [security officer] from Yitzhar (another violent(3) religious settlement overlooking Burin) who had not been present at the school. He alleged Ghassan had attacked him on a number of occasions previously. Ghassan said it was on account of the ravshatz’s allegations that he was sentenced to 26 months and ordered to pay 7,000 shekels (approximately £1,520) to the soldier he pushed. 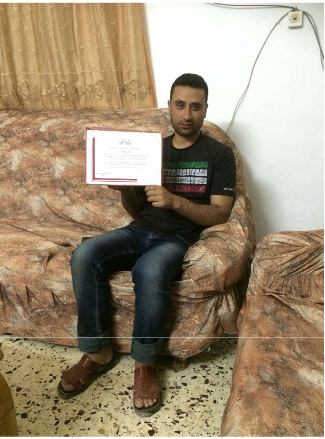 The family paid the fine, against Ghassan’s wishes. The ravshatz from Yitzhar talking to soldiers Ghassan described Gilbo’a as “a place of learning, a school for change rather than a place for becoming embittered.” Prisoners of all political persuasions, except for Hamas, lived together in one unit. They set up a daily routine consisting of classes, two hours reading, written tasks and sport in addition to preparing meals and watching TV. There were courses in Palestinian history, culture and crafts, economics and the his tory of colonisation and liberation struggles of other countries. 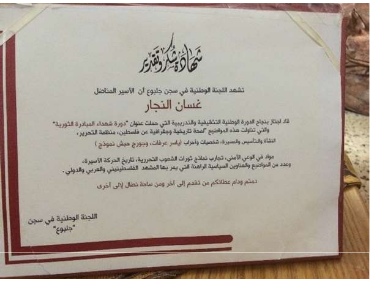 Prisoners taught each other and Ghassan proudly showed me the certificate he was awarded for teaching Palestinian history. Similarly, students were awarded diplomas for courses they had attended. “It was through the education I received in Gilbo’a that I learnt not all Jews were Zionists,” he explained, “and that my anger against our treatment by the Israelis and the Occupation should not be directed against all Jews, many of whom oppose what is happening to us.” It was also in Gilbo’a that Ghassan first went on hunger strike as an act of solidarity with Bilal Kayed, a Palestinian activist(4) who, after spending 14 years in Israeli prisons, on the day of his release was imprisoned again without charge. Disobedience tactics accompanied the initial call for Bilal’s release: “In every cell during morning roll call, prisoners would give Bilal Kayed’s name instead of their own.” The hunger strike started on 17 July 2015. “The evening before, we had received the coded message ‘Freedom awaits you’, meaning the strike would commence the following day,” explained Ghassan. Ghassan said that within days of starting the strike, he and another prisoner were put in isolation – a small windowless cell where the temperature often rose to 45oC which made his skin peel. On the sixteenth day, guards took away his underwear. He had no right to a shower during the 21 days of his strike. Most of the hunger strikers in Gilbo’a ended their action at 8.00pm on 7 August, following instructions from the unit organiser. However, Israeli officials forbade him from seeing Ghassan who was given the news of the strike’s end by a prison guard. Ghassan, therefore, refused to stop, adding that he would stop drinking water too. The strike organiser was called promptly to his cell. Recovery following the strike was hard: the prison authorities did not provide salt and the prisoners were given cold water to drink, which they could not digest. Ghassan described how they resorted to drinking warm water from the bathroom. Ghassan was released in September 2016 and returned home to a big celebration. But there were restrictions: for six months, he could only to walk in the streets around his house in the outskirts of Burin. However, this did not deter him from resuming his rôle as a community worker and activist. 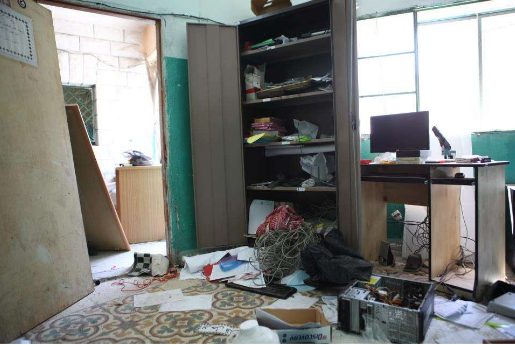 The Bilal Al-Najjar community centre which Ghassan had founded in 2007 was vandalised by Israeli soldiers in 2009 and 2010 and totally trashed in July 2013. Ten volunteers were beaten and twenty arrested. So since his release Ghassan has had to start afresh. He has formed the Target Association for Rural Development-Burin which holds classes, meetings and lectures, mainly for young people. With friends, he has also created a permaculture centre. In July 2017, despite personal threats he resurrected the kite festival attended by crowds of children and young people from the village and elsewhere. 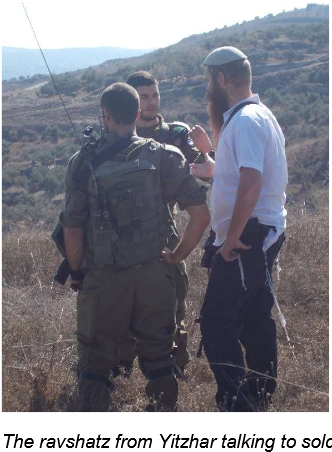 During the afternoon, soldiers and settlers appeared on a nearby hillside, exploding grenades(5). (3) Witnessed by the writer of this article during repeated visits to Burin. 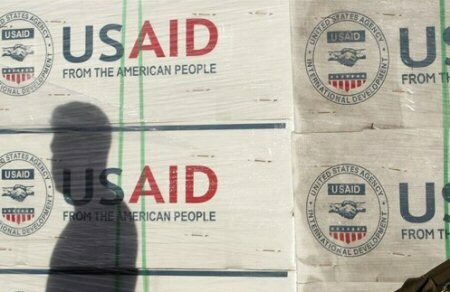 The United States Agency for International Development (USAID) will end all of its projects in the occupied West Bank and the besieged Gaza Strip on January 31st following the US administration’s decision to cut funding to the Palestinians, Dave Harden, former USAID Mission Director and Managing Director of the Georgetown Strategy Group, confirmed on Thursday. Ma;an News Agency further reports that the shut down on January 31st matches the implementation of the Anti Terrorism Clarification Act, a bill signed into law last October by the Trump administration, which creates liability for the Palestinian Authority (PA) should it accept any foreign assistance from the US government – effectively shutting dwon all USAID programming. The Jerusalem Post reported that several foreign nationals who were assigned to various USAID projects in the West Bank and Gaza Strip have left the country in recent weeks and months, together with their families, after being informed of the decision to end the projects they were working on, at the end of this month. US President Donald Trump’s administration notified Congress, in August 2018, of its decision to cut more than $200 million in bilateral aid to the Palestinians, following a review of the funding for projects in the West Bank and Gaza Strip.